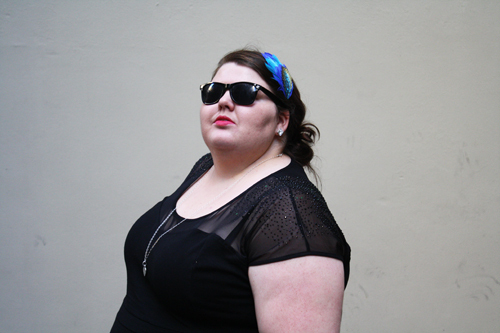 I didn’t really know what to do for this week’s Aussie Curves them ‘Song’. I started thinking that I would choose a song and then create an outfit which was inspired by that. Fairly straight forward. But what song? There are so many songs. There are so many GOOD songs. There are also so many songs about fashion. Where to start? At some point this week I managed to get Empire State of Mind by Jay Z and Alicia Keys stuck in my head. And it pretty much stayed there. And because of that, this outfit managed to snake its way into my mind. I have never quite understood how the Melbourne Cup was called ‘the cup that stops a nation’, but now I do. Having experienced my first one in an Australian workplace, I witnessed my colleagues all stop what they were doing for about half an hour and then all head back to work. But the best part was the fashion! Many of my colleagues dressed up and wore something pretty in their hair. 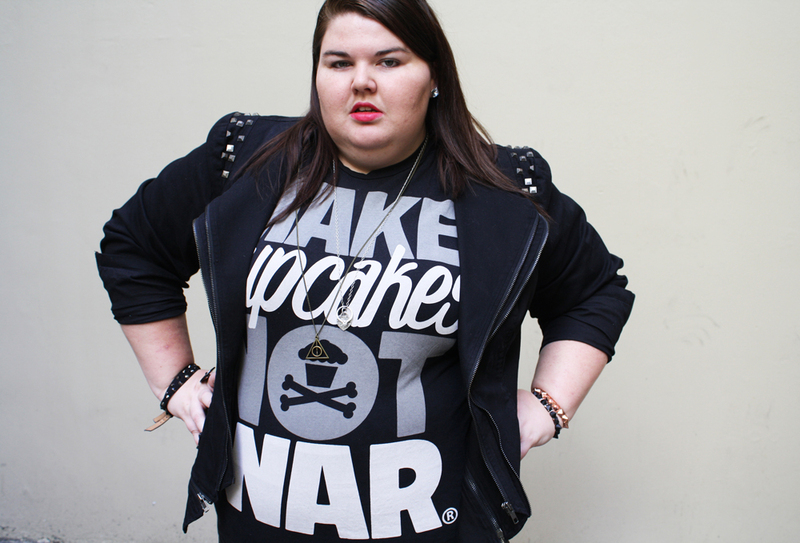 Here is what I wore. 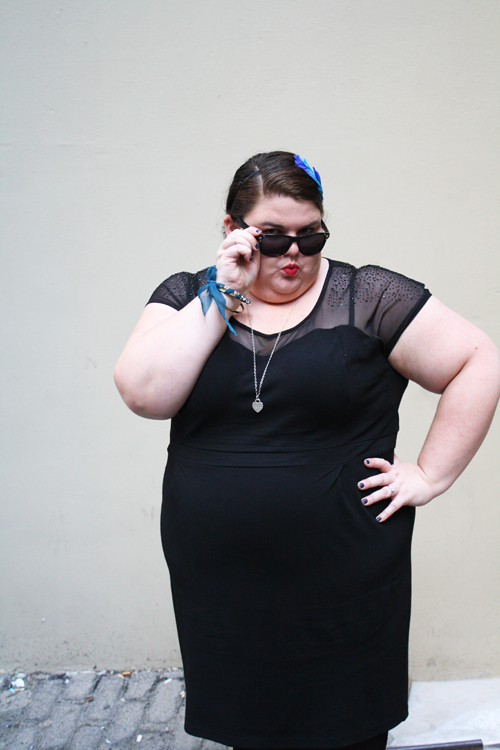 I actually don’t have that many ‘nice’ dresses. I’ve been looking for a some because I have a few events coming up this month which require cocktail attire. This one I have had for a little while and it was love at first sight. It’s really comfortable as it is made of ponte fabric, but it can be a bit warm for a Sydney summer. I love the see-through shoulders and the diamantes on it. Unfortunately these tend to come off in the wash and I have already lost a few. I should really know better by now to buy things with sparkles on. I paired it with the tights because I was going to work and wanted to be comfortable, and today was unusually cold compared to what it has been lately in Sydney. My hair piece is just a headband with the feathers attached. 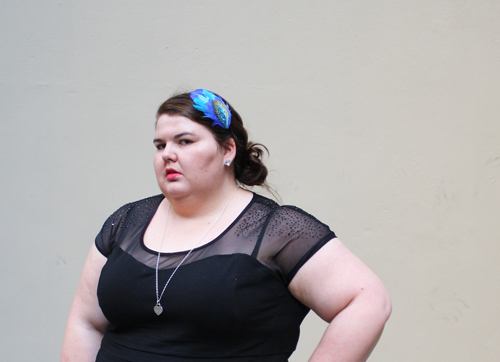 It has kind of become my go-to piece when I need to wear a fascinator. I did my hair in a simple, messy side bun. 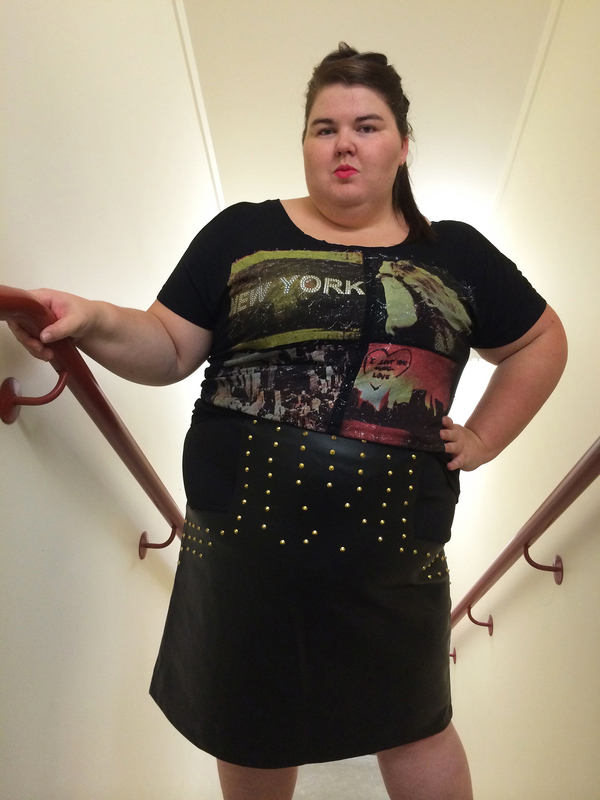 At the start of this week I had no idea which celebrity style I wanted to copy. My mind was blank. Finally Friday rolled around and I thought, I need to pick *someone*. So I turned to Pinterest for some inspiration. I started looking through celebrities and women’s fashion, but wasn’t really finding anything. Then I stumbled upon a photo of Demi Lovato and everything just fell in to place. Within five minutes I had an entire outfit planned. Anyway, here is what I have come up with. It’s kind of a mix of the two photos of her. I actually went all out for this and I had so much fun. I planned the hair, make-up and jewelry. 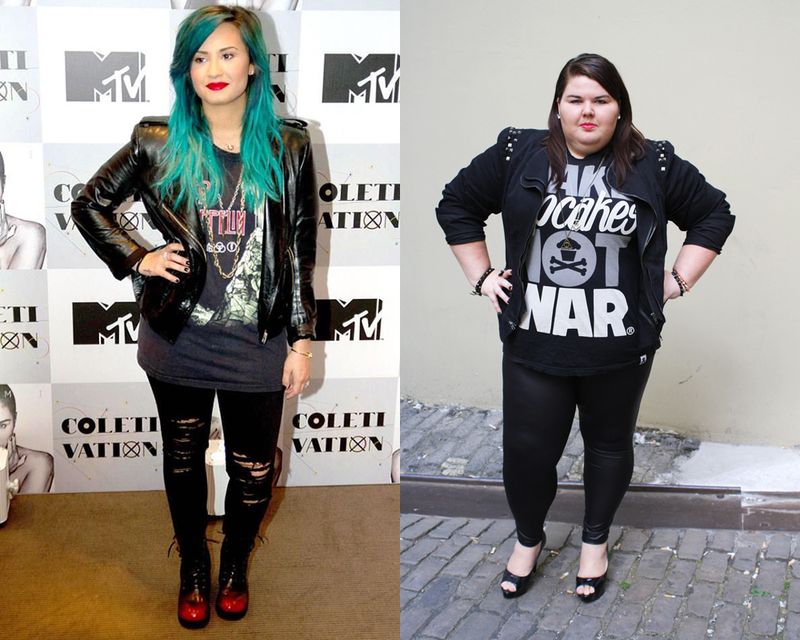 All fitting in with Demi’s style. My t-shirt is actually one I have had for ages and I still love wearing it. 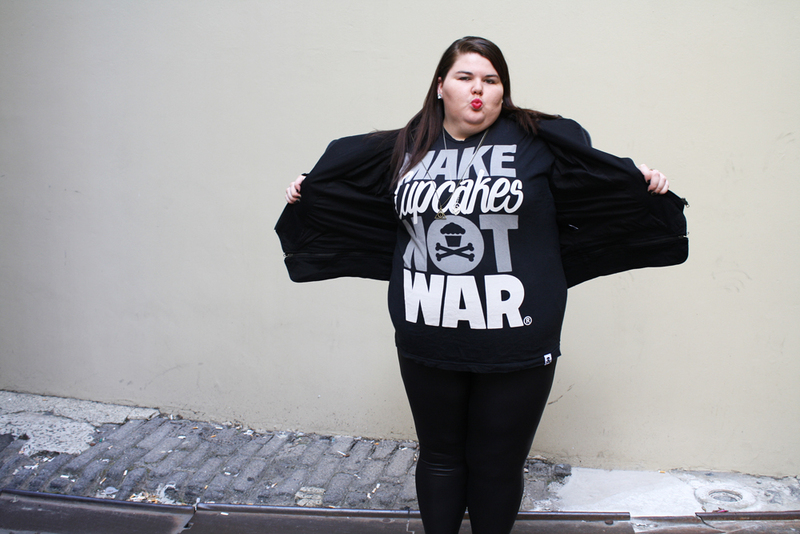 Yes it does say “Make cupcakes not war”, cause I love cupcakes and don’t like war. 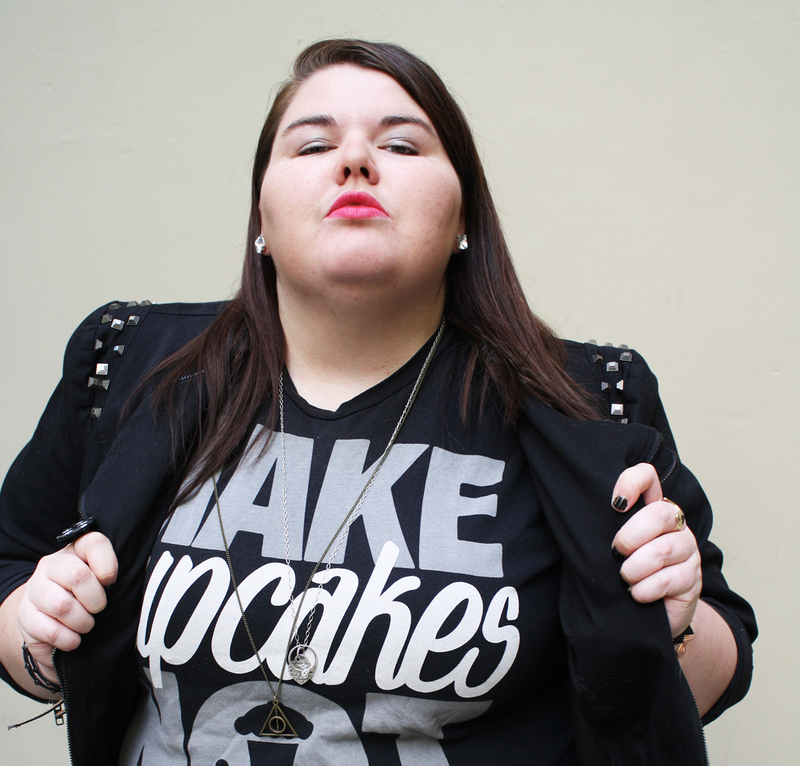 It is from Johnny Cupcakes, an American clothing brand that does all sorts of cool tees and clothing, as well as accessory type things. I chose this tee for the outfit because I don’t have any of my band t-shirts with me here in AU, but I think it still fit with the style. In the photos Demi has several chains, so I layered a couple of my normal necklaces I wear, just because I don’t own any chunky chains. I also wore a few cuffs/spiky bracelets, which she tends to wear quite often. I even painted my nails black for the occasion. Dedicated. It is Midnight in NY by Sally Hansen. It’s a great nail polish as it has a bit of glitter in it. 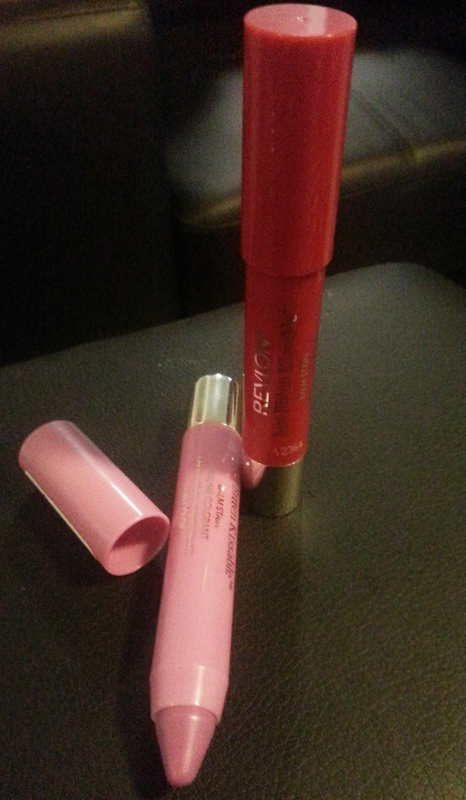 It also has a nice flat brush which allows for easy application, and it is fast drying. 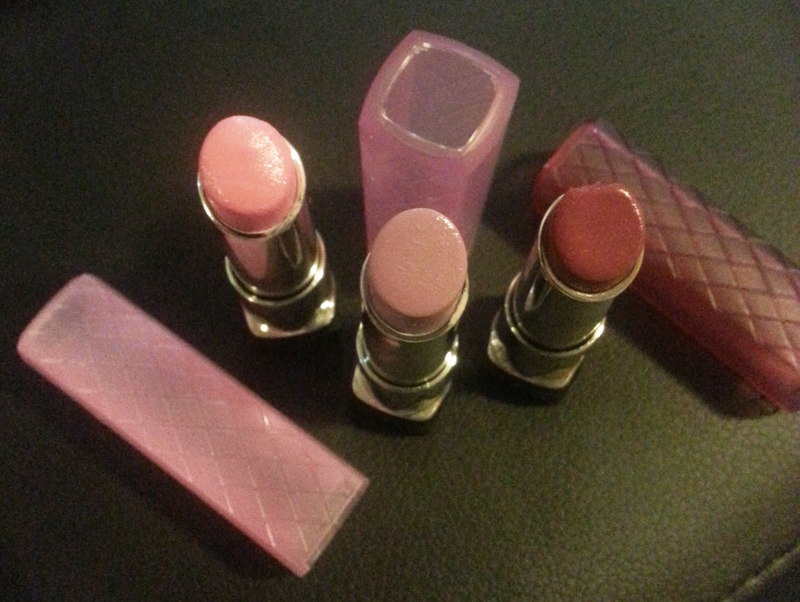 And of course the outfit wouldn’t be complete without a bit of make-up. 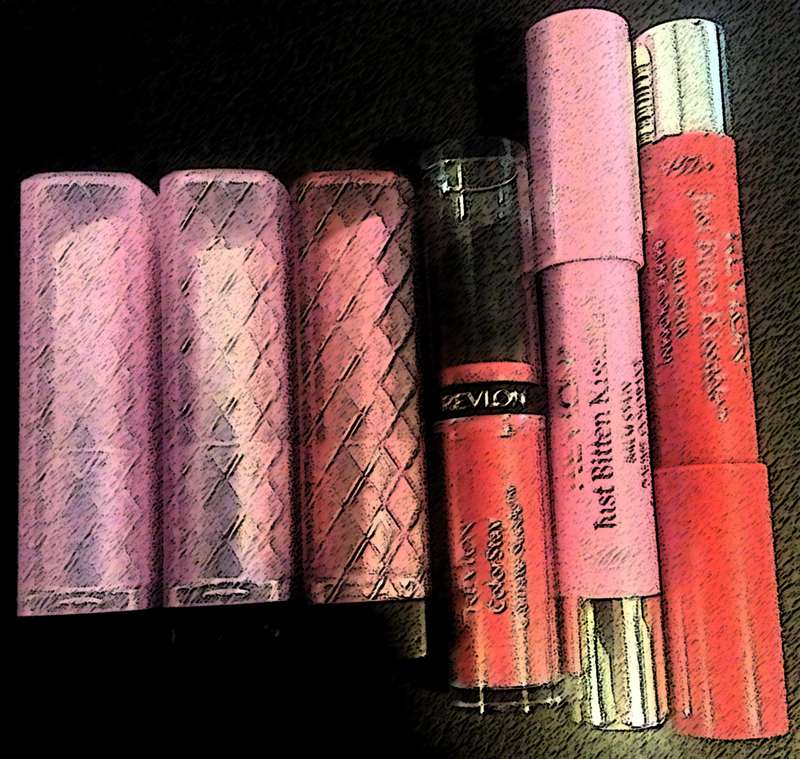 Demi was wearing a bright red lipstick, so I decided to pull out mine. 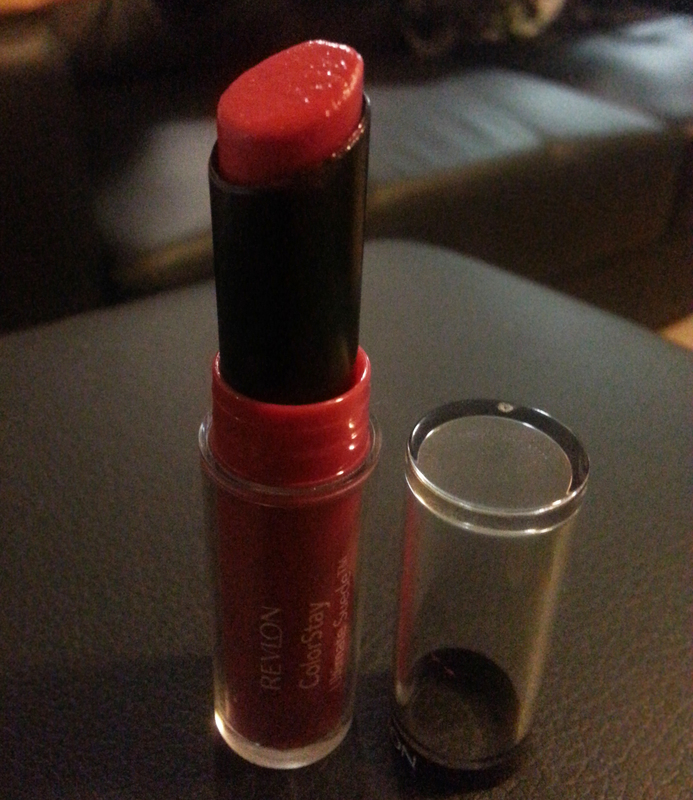 This is Revlon ColorStay Ultimate Suede in Trendsetter. I love it because it really does stay on once set and doesn’t come off on glasses etc. Also note my bling earrings. 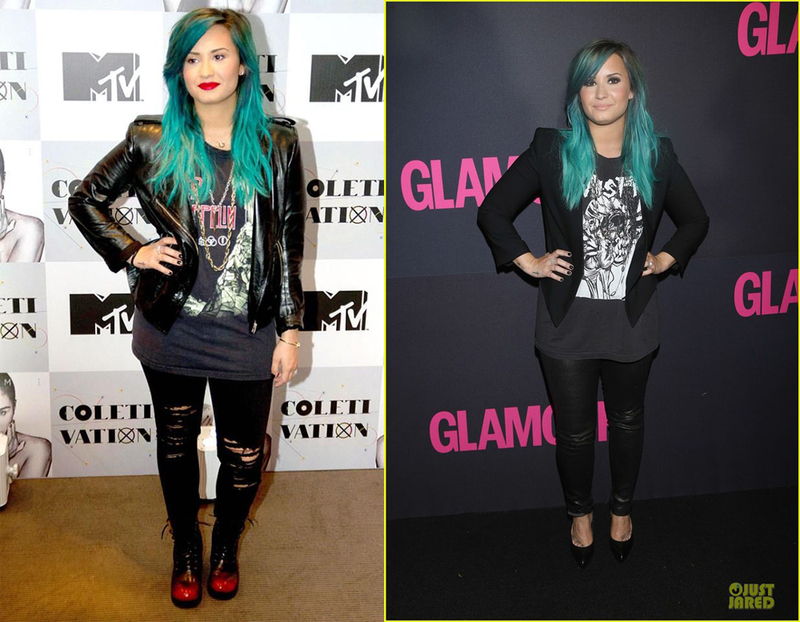 Demi had a pair on as well. So what do you think? Did I nail it? Also, new photo wall – AMAZING. Jewelry: cuff off a pair of shoes from Target, spike bracelets and earrings from Diva/Lovisa, necklaces from Tiffany’s and a market stall in Chatswood, cat ring from ASOS the other one I made myself from a button. I recently had a clean out of some of my jewelry having realised I have spent far too much money on items from places like Equip, Lovisa and Diva. Most of these items really don’t last very well – they tarnish quite quickly and tend to break. I’ve really gotten over buying this type of jewelry, so I actively avoid going into said shops to look anymore. I don’t want to waste my money on items that aren’t going to last, basically. I don’t wear a lot of jewelry anyway, so the pieces I do have, I want them to last and not, essentially, wear out quickly. Because I will wear them a lot. 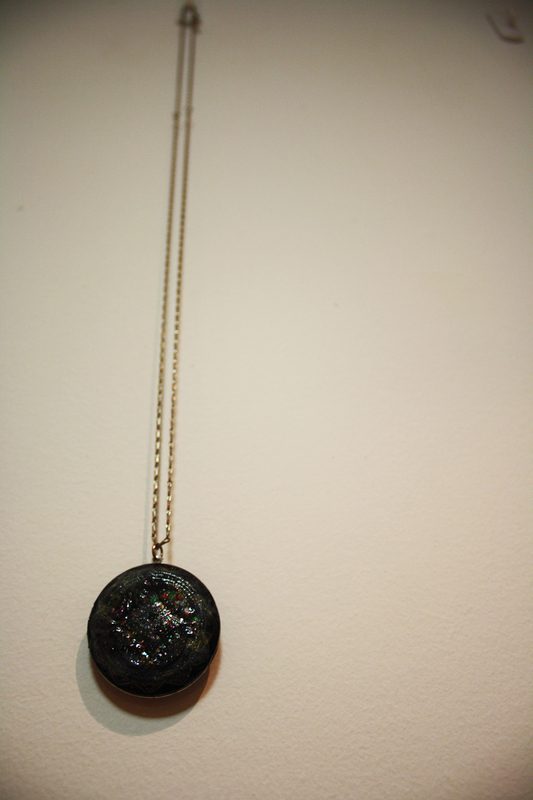 In saying that it lead to me being able to re-fashion a few of my necklaces. These were two of them before me doing anything, looking quite bad. The bird started out as silver. I attempted to blur the background (badly) in this image because it was on newspaper (some sports ad). 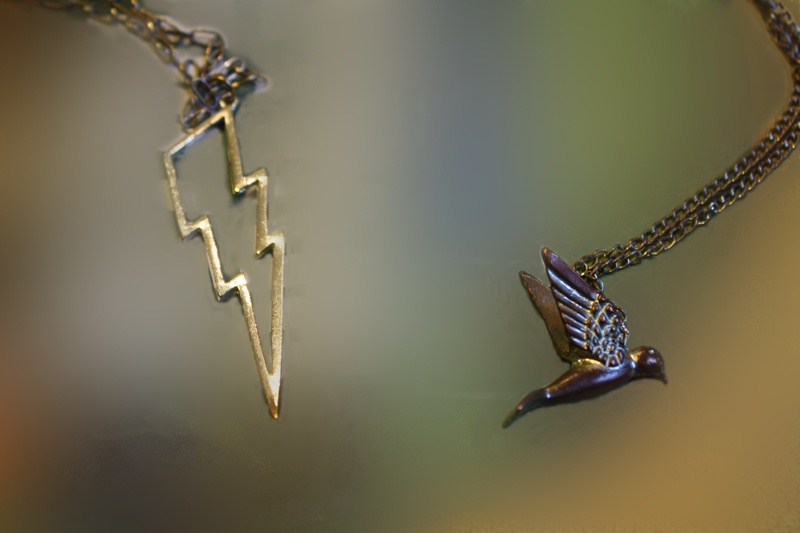 I’ve had the lightning bolt necklace for a few years now, I think I picked it up from Diva. It had actually lasted reasonably well apart from the necklace itself. But I decided to re-fashion it to make it look a bit different and bolder. 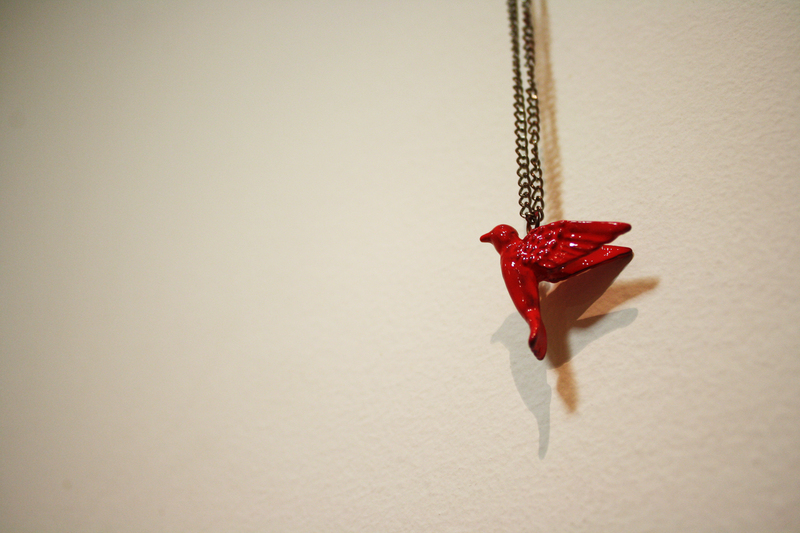 The bird necklace I got from Lovisa less than 12 months ago, it tarnished quite quickly and I have barely worn it for the last six months. 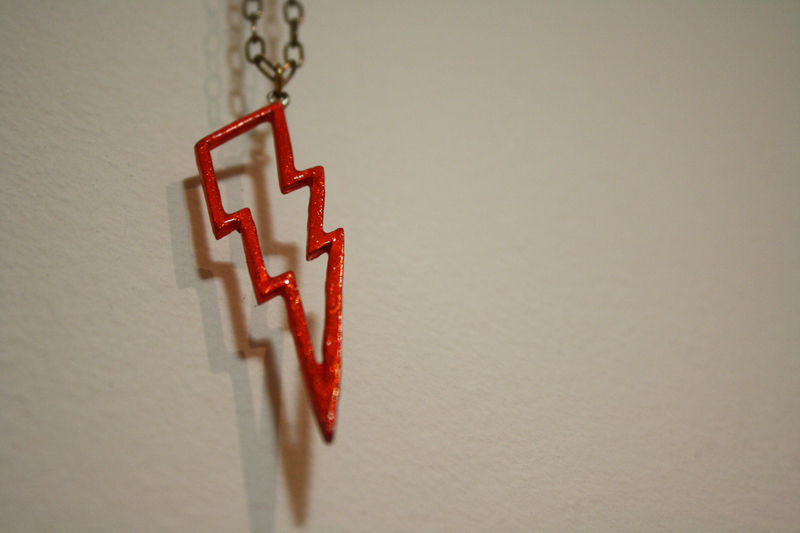 The lightning bolt necklace after my re-fashion. I just painted it with nail polish. This colour is ‘Riveting’ by China Glaze from the Hunger Games Collection. 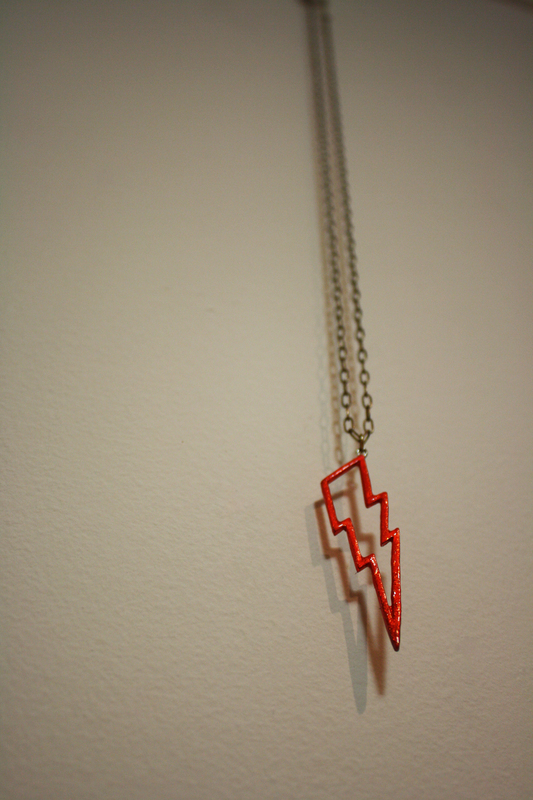 Definitely the right colour for a lightning bolt. As for the bird, I coloured the pendant in OPI’s ‘My Chihuahua Bites’. I wanted it to be a bright pop of colour. The best thing about re-fashioning necklaces with nail polish is that if it comes off, or you get sick of the colour, you can just pick another colour and paint it again! The last necklace make-over I did was on a locket necklace I have had for several years as well. Probably picked up from Diva or Equip. It was originally three lockets in one, which was really annoying as they got tangled often. I removed the other two lockets, which were broken, and re-connected the chain. You barely notice where the connection is. 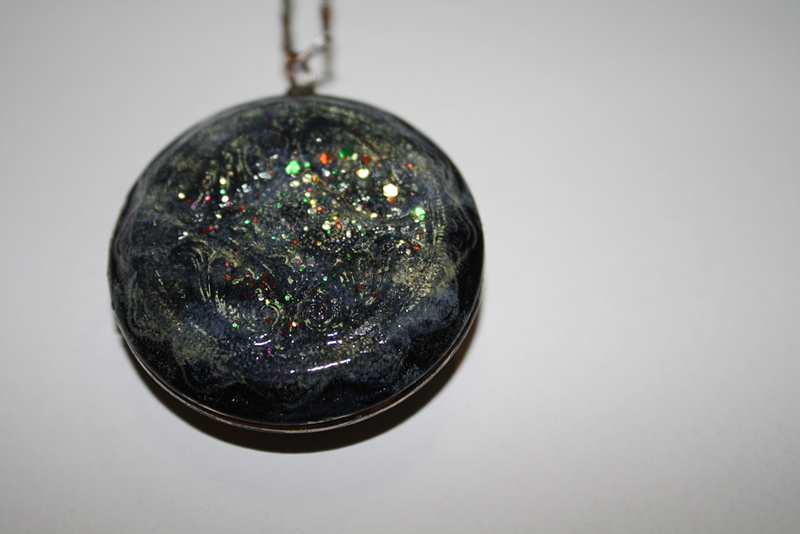 I wanted to try something different with the locket and came across a tutorial for making your own galaxy necklaces by Oh The Lovely Things. I didn’t get too many good photos of the stages of the make-over so have just left them out. There are about five different nail polishes used in this make-over. The dark base colour is China Glaze’s ‘Smoke and Ashes’ from The Hunger Game collection. I then used Revlon ‘Cloud’ and ‘Electric’ with OPI’s ‘Don’t Touch My Tutu’. Finally a bit of OPI’s ‘Rainbow Connection’ was used for glitter. I’m not that happy with how this turned out, mostly because it doesn’t look very galaxy. I feel I should have used similar colours to what the tutorial used, but I wanted to make it my own at the same time. I guess in time I will grow to like it, but I could always get a bit of nail polish remover, remove the paint and try again with different colours. 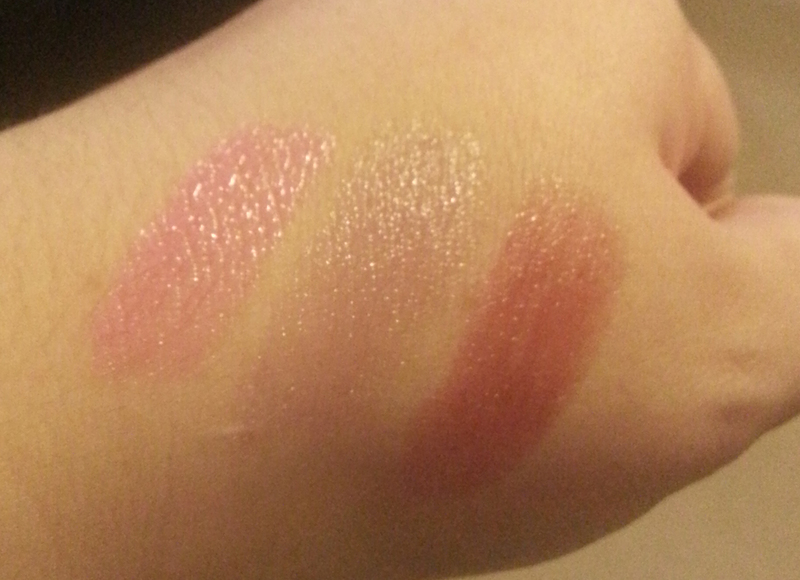 This photo shows the other colours coming through – you dab them on with a make-up sponge to get the desired result. What do you think of this jewelry re-fasion? Have you ever done this to jewelry? What other ways have you used nail polish, apart from on your nails?